Some may recall that a well-known individual shared a story about their newborn child being born with major health challenges. Their child received the best of medical care, and as a result, lived. That person has publicly told this story, extolling the incredible health care received that enabled survival. You may think that I am referring to the recent, emotional monologue of late-night talk show host Jimmy Kimmel describing his newborn son’s situation, but I’m not. I am referring to Wisconsin Sen. Ron Johnson, who has spoken openly about his now-adult daughter, born with a congenital heart condition requiring major surgical correction for her to live — and, as it turns out, to thrive and succeed. The senator has shared this story a number of times and relayed his admiration for the skilled clinicians, advanced techniques, and innovations that saved his daughter’s life and preserved her ability to become a capable, successful adult. However, there is currently a major threat to the ability of all children to be able to access this kind of care. While much media attention around the House’s passage of the American Health Care Act has been on provisions related to pre-existing conditions, also embedded in this bill are proposals to significantly weaken Medicaid — which not only covers more than 540,000 children in Wisconsin, but has been remarkably successful in doing so efficiently. Twenty-eight percent of all of Wisconsin’s children — and virtually all of my patients — are covered by Medicaid or CHIP (BadgerCare Plus), and that coverage means I am able to freely practice to the best of my ability. The AHCA’s provisions to do away with lifetime limit bans could mean that children like Sen. Johnson’s daughter could theoretically reach their cap on costs within hours of being born, given the intensity of the care required. This would affect all types of insurance, but for Medicaid, further threats arise. Other proposals — providing Medicaid funds as a block grant to states or with a per-capita cap — leave state Medicaid programs unable to respond to unexpected public health needs such as measles, Zika, or opioid epidemics. State budgets will be left vulnerable to high costs. You may note that I said that the AHCA’s weakening of Medicaid is a threat to all children. Surely it shouldn’t matter to those who have the benefit of employer-sponsored insurance, right? Actually, it should. If Medicaid disappeared, most children’s hospitals would see such a significant drop in their revenue that smaller ones would close and major institutions would be forced to scale back immensely. This would stifle their ability to train high-quality health care providers, gain expertise in new procedures, and develop innovations. If Medicaid is hobbled, we all lose out. No child should be denied medical care, whether surgical procedures, primary care, or otherwise. Yet, under the AHCA, some children may not have that opportunity, while others will — for now. Providing meaningful health insurance for children is inexpensive — children make up over half of all Medicaid recipients nationally, but account for a mere 20 percent of costs. That insurance greatly increases the chances that children grow up healthy, educated, and able to contribute to our society and mutual prosperity. That nascent talent is equally distributed throughout society, but opportunity is decidedly not — and Medicaid is one factor helping level that playing field, to the benefit of us all. The Senate is now considering what to do with the AHCA, and how it should be changed. Sen. Johnson, please consider what options may not have been available to you as a worried new parent, had our nation’s pediatric care capabilities not had the advantage of growth through programs like Medicaid. For the good of us all, preserve Medicaid and protect our children. 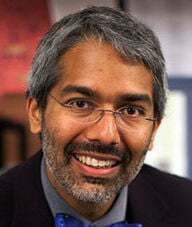 Dr. Dipesh Navsaria, MPH, MSLIS, MD, FAAP, is an associate professor of pediatrics at the University of Wisconsin School of Medicine and Public Health and also holds master’s degrees in public health and children’s librarianship. Engaged in primary care pediatrics, early literacy, medical education, and advocacy, he covers a variety of topics related to the health and well-being of children and families. Access his Facebook page here.